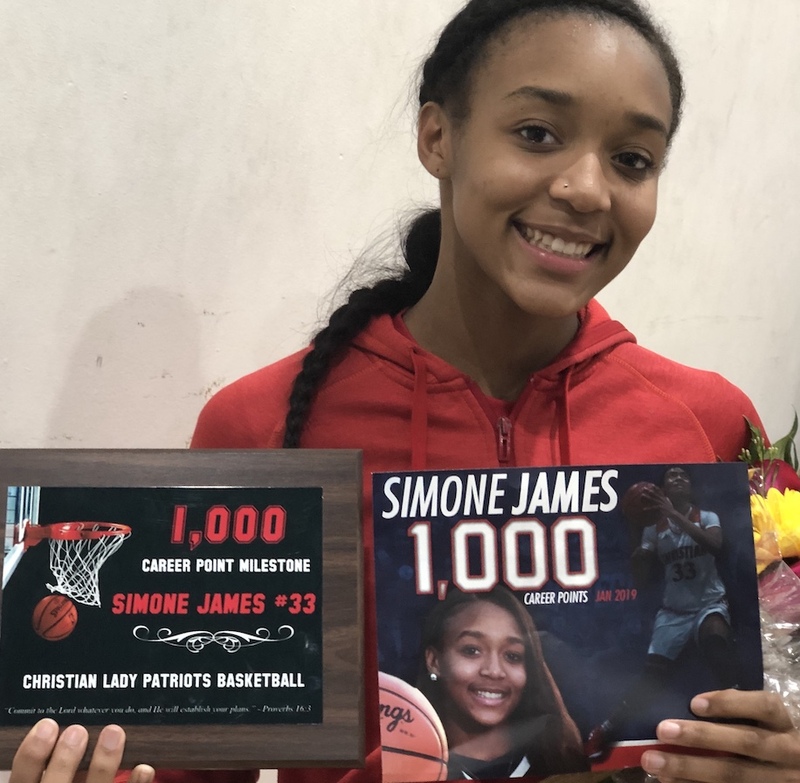 Christian High junior SIMONE JAMES surpassed 1,000 career points in the game against the Dons. 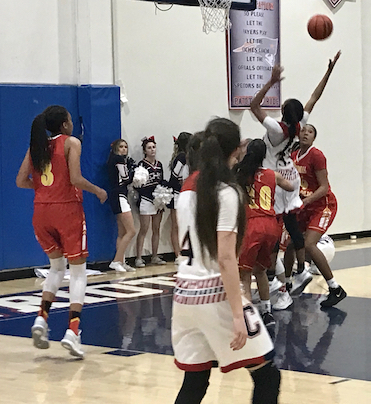 EL CAJON – Christian High junior ALLIE CARREON hit a buzzer-beater jumper to force overtime and junior teammate SIMONE JAMES surpassed 1,000 career points, however, the second-ranked Cathedral Catholic Dons defeated sixth-ranked Christian High, 73-70, in a key Western League game at Ryan Athletic Center on Thursday night. 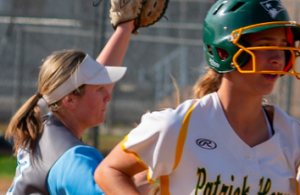 The Dons improved to 8-1in the Western League, while the Patriots fell to 6-1 in league play. 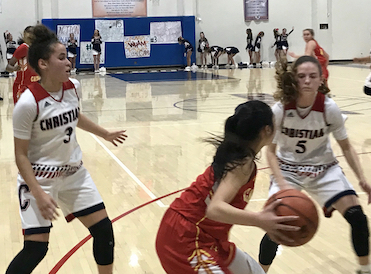 On Christian High’s Senior Night, Cathedral raced out to a 10-0 lead in the first quarter but the Patriots eventually took a 22-18 lead by the end of the period on a three-pointer from Carreon and another bucket by senior ZOE NORDLING. But the Dons re-assumed the lead in the second quarter to take a 34-30 lead into halftime. 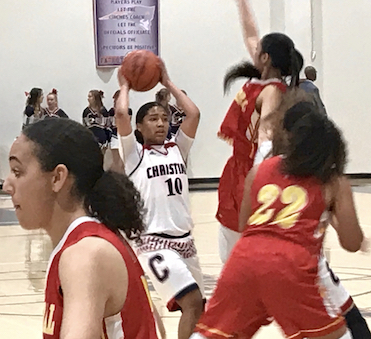 In the third quarter, Carreon had a three to put the Patriots back on top, 35-34, then sophomore KRISTIN WILLIAMS added a three-pointer, and James made a pair of field goals as Christian went up 42-34. But the Dons surged back to take a 50-49 lead after three quarters. A wild fourth saw both teams take back the advantage but it was Carreon’s shot as time expired that sent the game in overtime. The Dons led throughout the extra session, however, although Christian kept their poise to keep the game still within reach. Carreon had another three-pointer to close a five-point lead to 70-68, and James knocked down a pair of free throws to pull to within 71-70. Christian is still very much alive for the league title or to share the banner with the Dons. 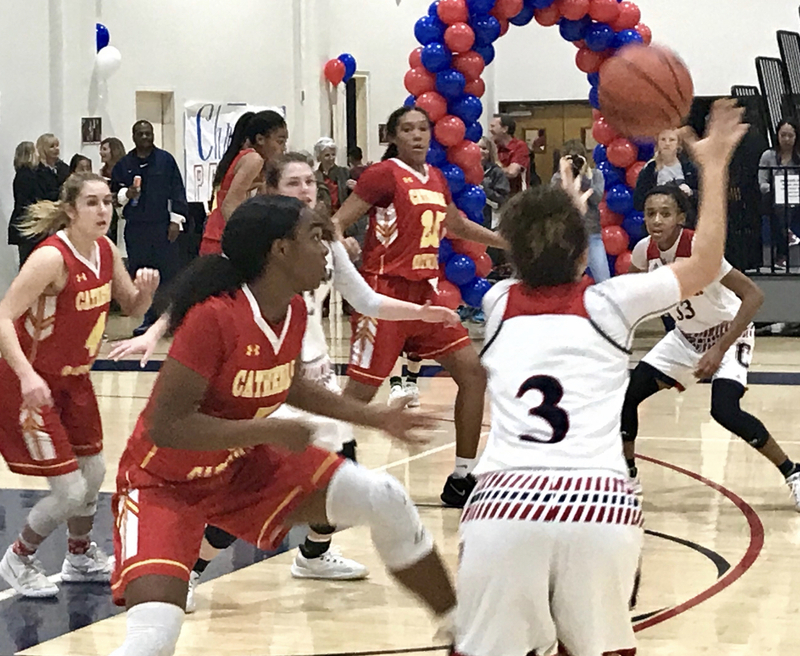 Cathedral Catholic returned the favor against the Pats for a 62-51 defeat at the hands of Christian High in its gym back on Jan. 11. 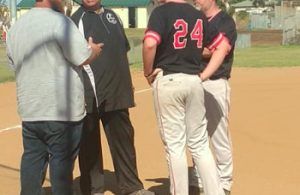 Cathedral can clinch at least a share of the championship by winning its final Western League contest, while the Patriots have a little more work to do starting on Friday night against third-place Scripps Ranch, as Christian still has three league games left to play. The teams are destined for a possible Open Division playoff showdown, as well. 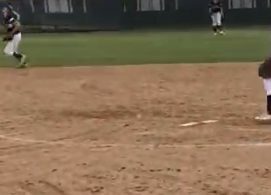 Also celebrating their last regular season home game were fellow seniors JASMYN CRAWFORD and MAILANI AGUILA.